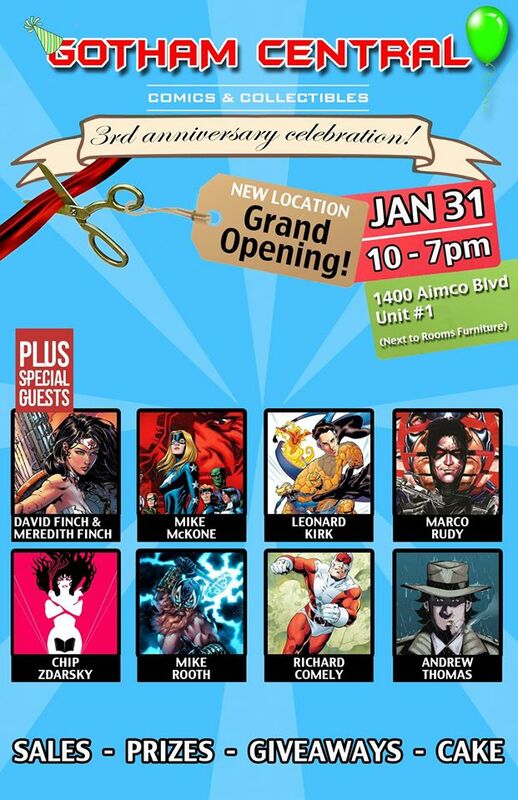 This Saturday in Mississauga Ontario, Gotham Central will be hosting a new location grand opening, among the honoured guests will be Captain Canuck creator Richard Comely, signing the newly released Captain Canuck Action Figure. 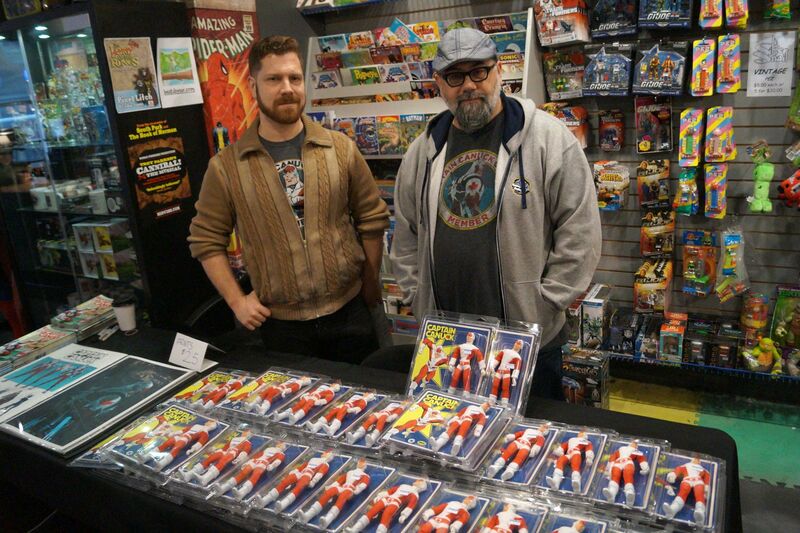 This past weekend saw the launch of the 8″ Odeon Toys Captain Canuck action figure in comic shops across Canada and thanks to our spies we captured a lot of it. Above is current Canuck artist Kalman and Silver Snail owner George setting at the downtown Toronto location for a signing event. 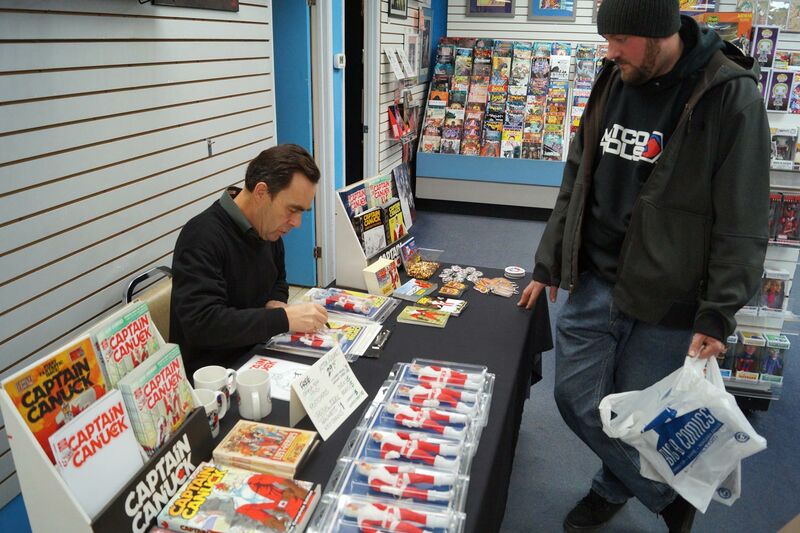 At Big B Comics in Hamilton, Captain Canuck creator Richard Comely signed figures for anxious fans. Any one who’s ever met Richard can tell you he’s an extremely genuine person. 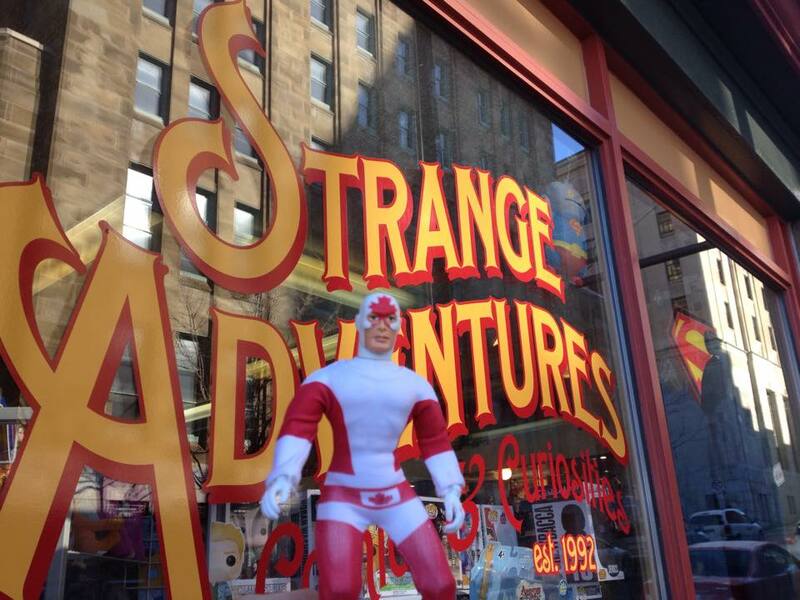 This is Strange Adventures in Halifax, although you can buy the Captain at any of their 3 locations in Nova Scotia and New Brunswick. Big B in Niagara Falls had a beautiful display of figures right smack in the center of the store. Visiting there is a must if you’re visiting at the Falls, it’s not far from Clifton Hill. 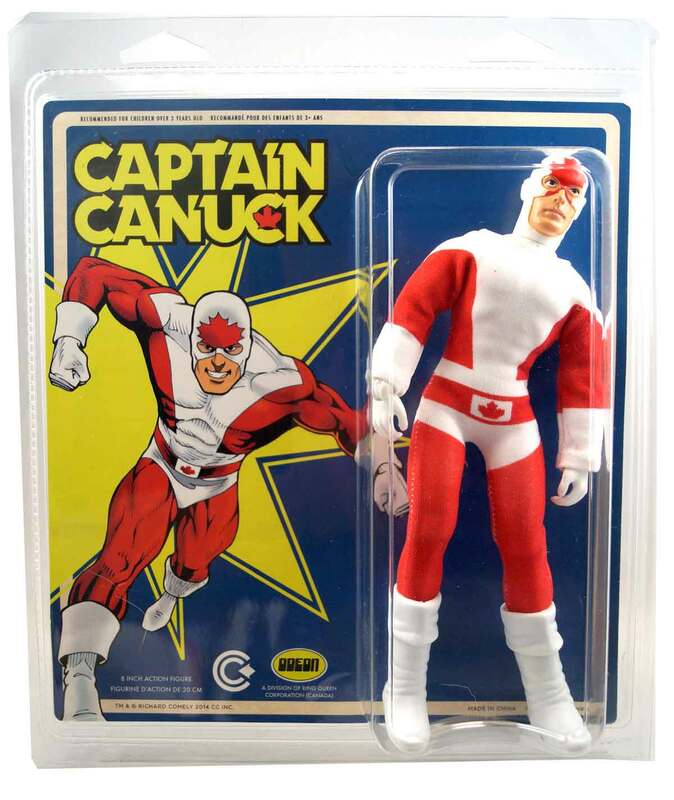 Where to buy Captain Canuck? 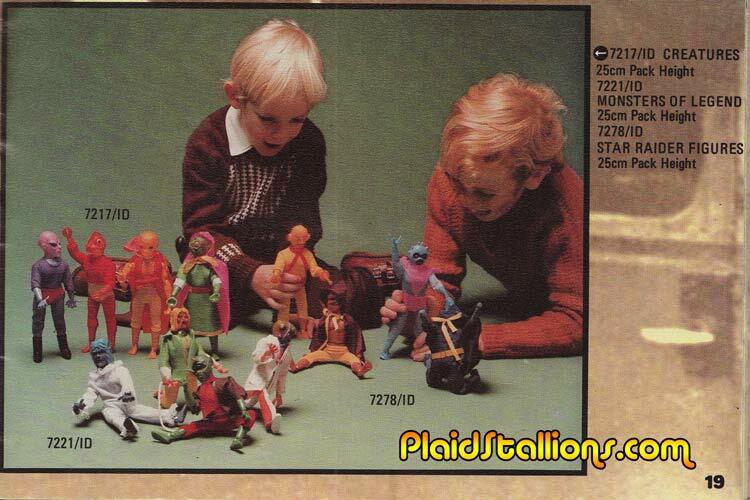 You can always order the Captain Canuck figure from the PlaidStallions Online store, especially if you’re not in Canada. If you are in Canada and live in one of these cities, it’s always best to support your local comic shop, call them today to reserve your Canuck! 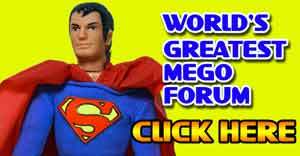 You don’t see this everyday, a seller has listed every single Kresge Card for the Mego World’s Greatest Superheroes on Ebay. I don’t know who has 60k kicking around to buy a collection like this in one fell swoop but I do know I’d pay $2 to look at it for a while. Drool at it over here. 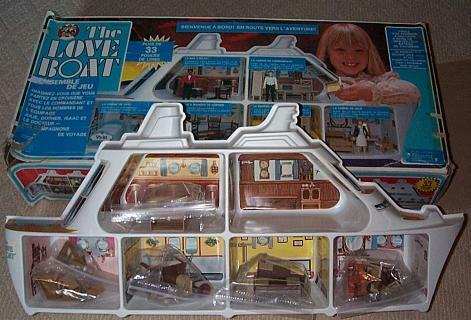 There are actually two Love Boat playsets and they look so alike that they cause confusion, this I believe is made by multiple toys and features smaller scale figures of the crew and passengers. From what I gather it’s hella rare too. 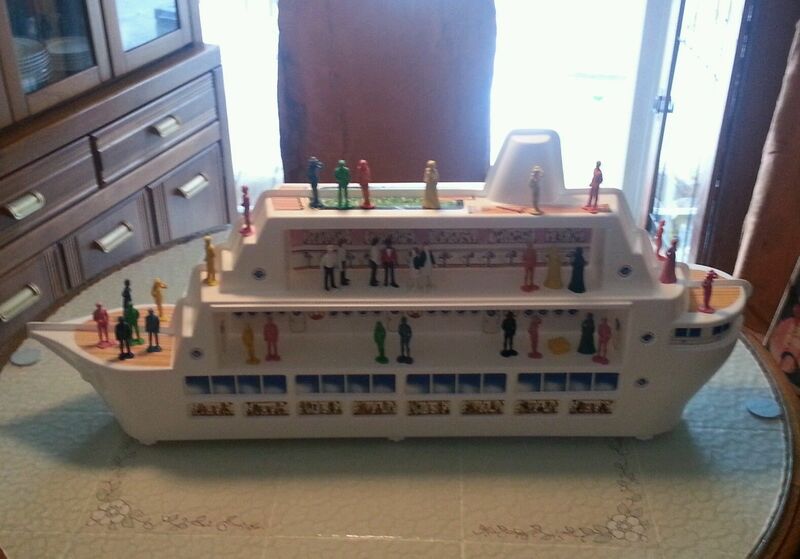 So the big question is, where the f*** are my Fantasy Island toys? 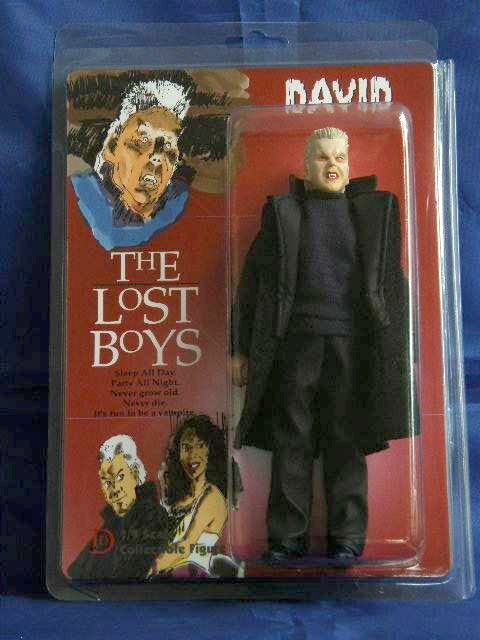 The folks at DD impress me both with their talents and their regularity, this month they’ve released David from the Lost Boys as part of their Mego Style horror collection. Limited to 60, these certainly won’t be available for long. Order it at the Distinctive Dummies Website. Captain Canuck goes on sale this month! 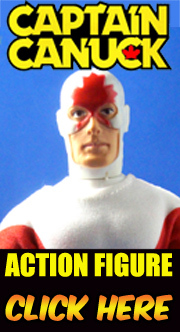 Odeon toys just put this carded image of Captain Canuck on their front page, stating that Captain Canuck will soon be available for sale on their web store. Seems the figure is going to launch with an event of some kind. 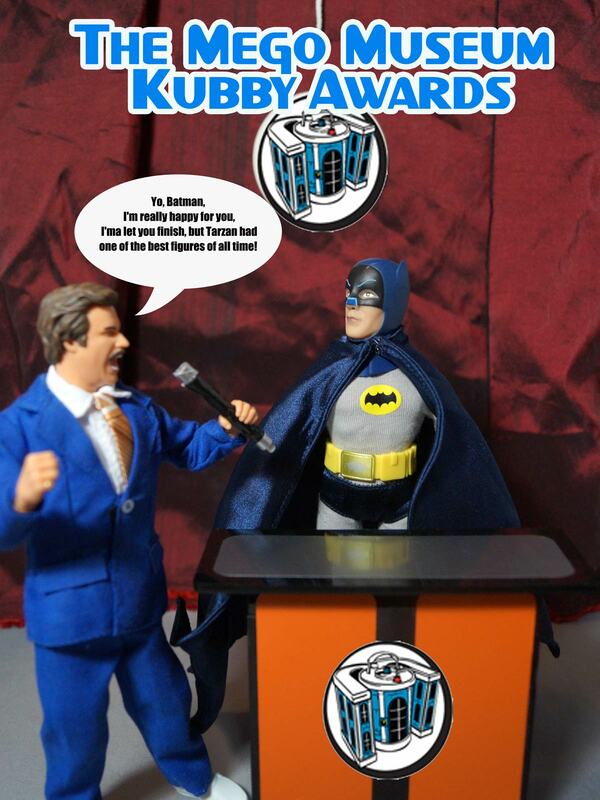 The 2014 Mego Museum Kubby Awards for excellence in ReMego are up for viewing right now. It shouldn’t come as a big surprise that Figures Toy Co and NECA pretty much stole the show this year but I do think some nice stuff got ignored. 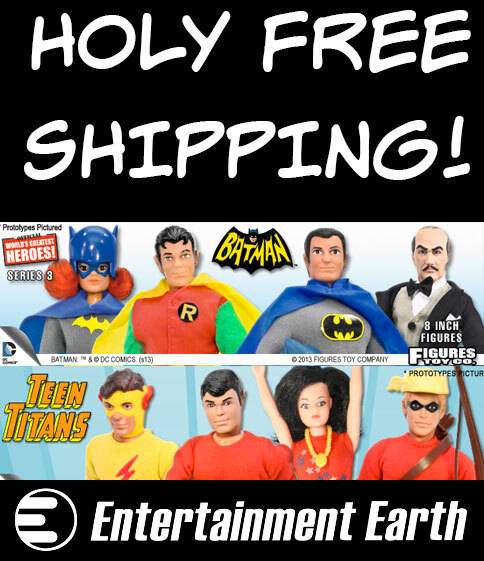 I guess when you have a property as beloved as 1966 Batman and then you actually do a nice job of the figures, you really have lightning in a bottle. Congrats to the winners! I always look forward to seeing what obscure DC or Marvel character Austin has mined from the “Who’s Who” and made into Mego gold. Here he’s made an obscure Aquaman villain look pretty darn cool. 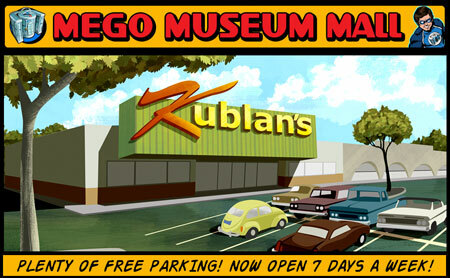 See more at the Mego Museum.